The Governor of Arkansas is the head of the executive branch of Arkansas's state government and the commander-in-chief of the state's military forces. The governor has a duty to enforce state laws, and the power to either approve or veto bills passed by the Arkansas Legislature, to convene the legislature, and to grant pardons, except in cases of treason and impeachment. The state has had 45 elected governors, as well as 10 acting governors who assumed powers and duties following the resignation or death of the governor, totaling 55 distinct terms. Before becoming a state, Arkansas Territory had four governors appointed to it by the President of the United States. Orval Faubus served the longest term as state governor, being elected six times to serve twelve years. Bill Clinton, elected five times over two distinct terms, fell only one month short of twelve years. The shortest term for an elected governor was the 38 days served by John Sebastian Little before his nervous breakdown; one of the acting successors to his term, Jesse M. Martin, served only three days, the shortest stint overall. The current governor is Asa Hutchinson, who took office on January 13, 2015 after his election on November 4, 2014. 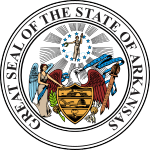 List of Governors of Arkansas Facts for Kids. Kiddle Encyclopedia.